The A3000 is an E-mount camera which looks like an SLR but takes all your E-mount lenses and has a pretty good 20 megapixel sensor. It even has a metal lens mount. So what has been saved? You can now (2018) find these five-year old bodies for as little as £100. The saving is mainly in the expensive EVF innards – it uses a tiny 0.2″ display and a high power eyepiece, more like a consumer compact with a token EVF. There’s not much really, in a difference of just three tenths of an inch. There’s even less when the inch isn’t a proper inch, but the sort of inch used to express the size of sensors or display chips. Except, that is, when the difference is between 0.5 inch and 0.2 inch and you’re comparing the electronic viewfinder of cameras like the A6000, NEX-6 or Alpha 77 with the EVF found in the entry-level Alpha 3000 (above and below, from both sides). I’ve had the Alpha 3000 (ILCE-3000, Sony model reference number) now for a few weeks (writing in 2013), and used it as much as my eyesight and patience would permit, given a wide choice of other cameras to use instead during the same period. I can now say without fear of being shot down in flames that it has the most inadequate electronic viewfinder I can remember using, including finders on various bridge cameras of the distant past. The viewfinder of the vintage Konica Minolta Dimage A2 used a 0.44 inch 922,000 pixel display chip with a generous eyepiece size and accommodation latitude. That is, anyone able to focus their eyes comfortably between 1m and 3m, with or without specs, would rarely need to touch the dioptre control. 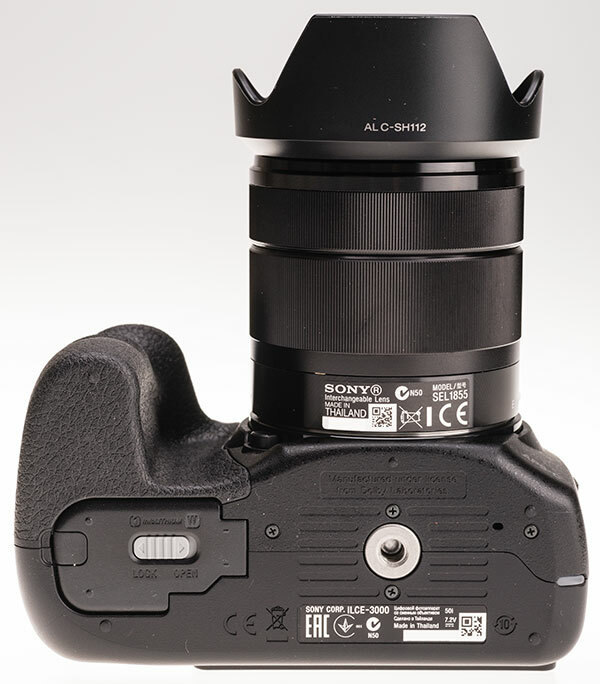 The Alpha 55 used an 0.46 inch and the Alpha 77 (and accessory EVFs) 0.5 inch. The A3000 eyepiece has a hard plastic surround and small, only slightly recessed ocular. The accessory shoe is over the eyepiece unit not over the camera body, and the eyepiece assembly sticks out well clear of the screen. 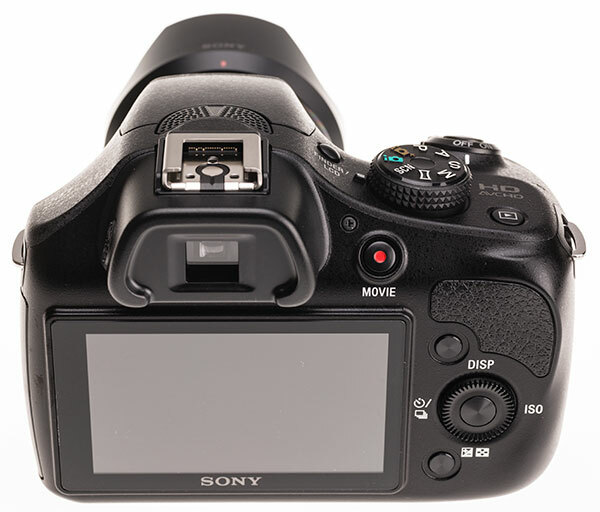 The Sony A3000’s EVF has 201,600 pixels, not even equal to one-quarter of the 2004 Dimage A2 bridge camera’s display. Because it is such a small chip – a mere 2.88 x 2.15mm which compares to a match-head or a grain of rice – the viewfinder eyepiece has to be a low powered microscope. Like any cheap microscope, it only looks sharp if your eye is precisely centered and the slightest nudge to the focus (dioptre) blurs the image. I found that the click-stops of the dioptre control on the A3000 were so crude it was possible to have a sharp image between them, yet uncomfortably unsharp when set to the clicked position either side. I can’t put a graphic of the actual size of the display chip here, because different screen resolutions would change its size. To make it worse, the quality of the ocular lens is very poor, with distortion and smeary blurring together with considerable flare from the brightly illuminated display chip; it does not have the level of multicoating or internal light baffles to present a crisp clear view. Since the main selling point of the A3000 over any comparable camera is that it has a built-in EVF, the extremely ‘stretched’ design parameters of this EVF will cost it sales in actual stores where it can be tried out. The A3000 kit box. This unit is made for more than one country’s market. Inside there’s no software CD, and that super fat looking manual is actually a minimal introduction to the camera printed in 12 languages. It is the Rosetta Stone for a future alien civilisation discovering the remains of Earth! The bonus for buying a multi-zone package is that you get stubby cable UK and European mains leads. There is no battery charger, instead you get a 5v USB transformer (as with the RX100 and RX1 models) and a USB cable to charge the battery in-camera. 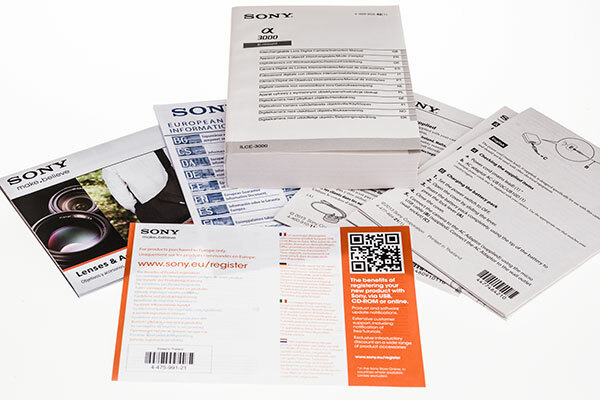 The neckstrap is Sony’s standard chafing and scratching type. 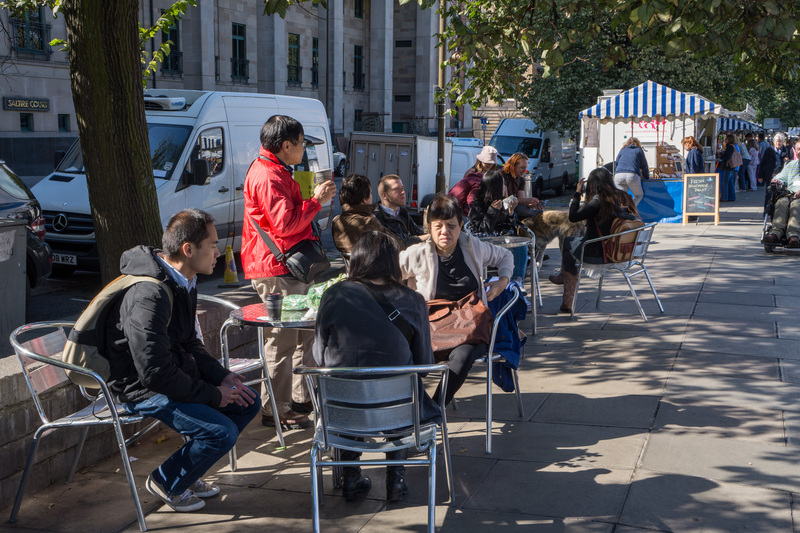 Children, young women and most people under 40 in bright weather will find they can accommodate just enough to use the finder comfortably, though the vague smudge which represents the scene is only to be considered as a composition guide. If you are male, over 40, have typical Western rather than Japanese eyesight age-related changes and try the camera out in a dimly-lit environment you’ll hand it back to the salesman and buy something else which is easy to view through and shows a clear sharp image. That said, the entire camera and its 18-55mm SEL black metal skinned E-mount lens costs a bit less than the accessory EVF for the RX1/100II. And you read that right, this is an Alpha (so are all NEX cameras, as anyone able to see the Greek letter on them will realise) but it’s not an Alpha A-mount. And though it looks like a DSLR or a DSLT, it is neither. The A3000 is nothing more than a rather appealing sensor upgrade to the NEX range, accidentally fitted into a NEX-3 body, dressed in a hollow plastic sumo suit. In Spain you can see parades with impressive giants, twice life size, concealing a very strong young man who can make them dance. That’s rather what the A3000 is like. On an iMac 27″ screen you will see the NEX-5n and A3000 precisely life size. The front face of the mounts has been aligned. My photograph doesn’t just show the relative sizes of the 5-series NEX body and the A3000 together. I have positioned the front face of the lens mounts to coincide. This enables you to see how much space is wasted BEHIND the sensor in the A3000. There should be no cooling problems for extended video shooting with so much air circulation! The A3000 has an focal plane index mark to show where the sensor actually sits inside the body (hard to see – right hand end above the strap fitting) but it’s ahead of the middle of the 38mm thick body, as the mount to sensor distance is 18mm leaving 20mm behind it. The whole body, though it can claim to be small by SLR standards and therefore get a ‘smallest lightest’ accolade, is just a big plastic skin inside which the intestines of a much smaller NEX have been concealed. You get the same 3-inch rear screen, though without any kind of articulation or touch function and only 230,000 pixels like much earlier generation cameras. You get a genuine metal lens bayonet mount not a cheap plastic version like the A-mount Alpha 58, presumably because the entire NEX system has always been of much higher overall precision than the A-mount range (just as the 1990s Vectis APS cameras were built to finer tolerances). You also get a metal tripod bush, though this is in an odd position for panorama fans, located close to the focal plane but well centered on the lens axis; a really well-shaped right hand grip taking advantage of the larger body size. It uses NEX-3 style controls lacking any front or rear wheels and just using the back mounted dial-rocker and unmarked soft-function buttons. 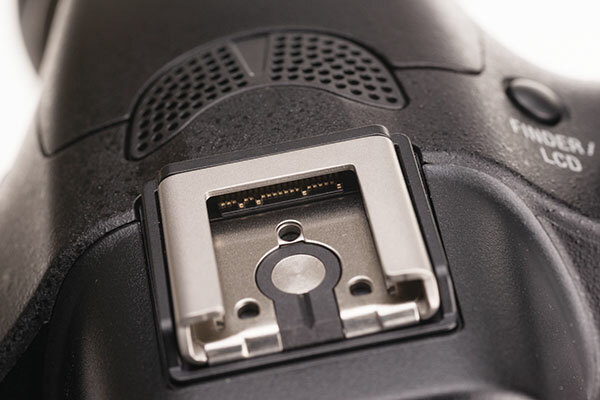 There is a super-simple interface on the left end of the camera with a single SD/MSPro card slot and a versatile USB connector which is remote release compatible. The big bonus is on the camera’s fake prism top (which does have a GN4 flash, unable to control wireless flash, but giving excellent exposure and coverage with the 18-55mm). Here you find the Sony Multi Function Accessory Shoe, reassuringly metal and hiding an array of contacts under its forward edge. The A3000 has no HDMI port, no microphone input despite pretty good built-in stereo mics, no remote release socket, no wifi, no GPS, no wireless flash, no studio flash sync socket. It can or will have all of these through the Multi Function shoe. I have not been able to check whether it can also support one of the superior EVFs which would fit (I do know that the Alpha 99, for example, does not support an RX1 EVF mounted in its similar shoe). Perhaps Sony’s expectation is to sell barrowloads of these extremely cheap (£299/$399) entry level interchangeable lens cameras and see the new owners buy two or three lenses, flash, microphones and more. It’s about time they actually launched the GPS module which this shoe is contact-pinned to accept. Against all the minimal feature set and basic menu-driven user interface must be set one of the best sensors around, the 20 megapixel APS-C seen earlier in the Alpha 58. It is not a stunning sensor, in that some noise can be seen even at minimum ISO, but that may be because it’s got a very weak AA filter (helps with contrast detect focusing) and decent colour discrimination. Applying just a little raw conversion NR keeps the images clean up to 1600 and allows usable (professional, on-line library etc) ISO 3200. It can go beyond this right up to 16,000 but if you need this sensitivity, you’ll find the EVF so noisy and dark it’s hard to see anything at all. At ISO 800 (click these sample images for the full size file) you can see the general focus accuracy and sharpness of the 18-55mm used wide open, f/5.6 at 55mm, and also the quality of the flash for shots like this. 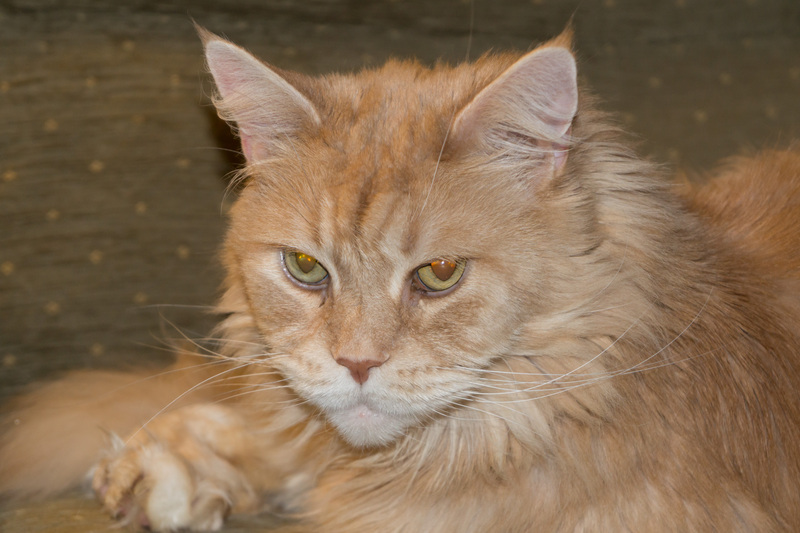 This is an ISO 12,800 in-camera JPEG at default settings. This is the same shot carefully processed using Adobe Camera Raw Photoshop CC. 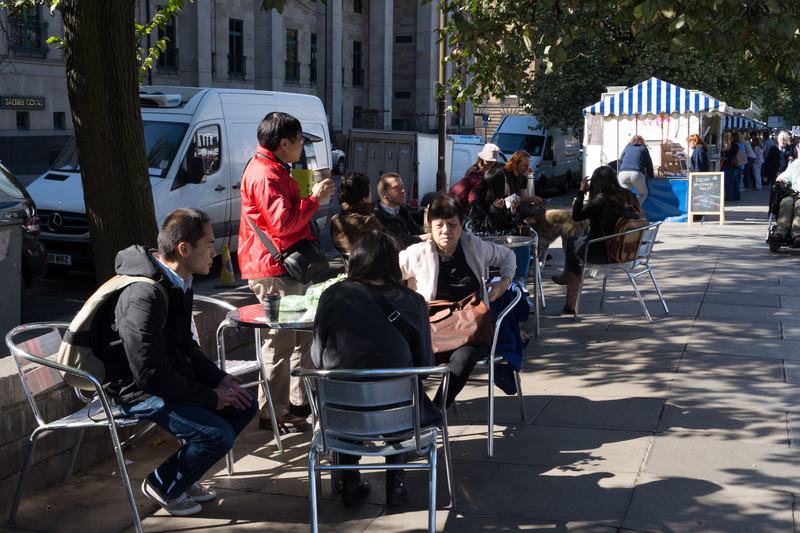 Here’s a shot at f/8 and 18mm, at ISO 100 (minimum) processed without any NR or sharpening from raw. The sky blue does show some noise even at this low setting. The sharpness of the focused zone (to the left side) is excellent. 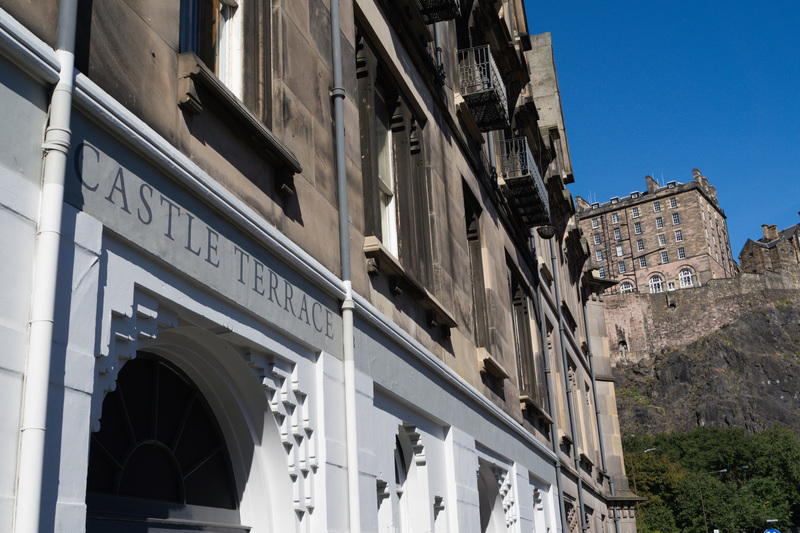 Inside the Castle Restaurant, Edinburgh, the light is natural window-light, looking good but fairly low. This is 1/30th at f/9 with ISO 3200, processed from raw with some sharpening and some NR. 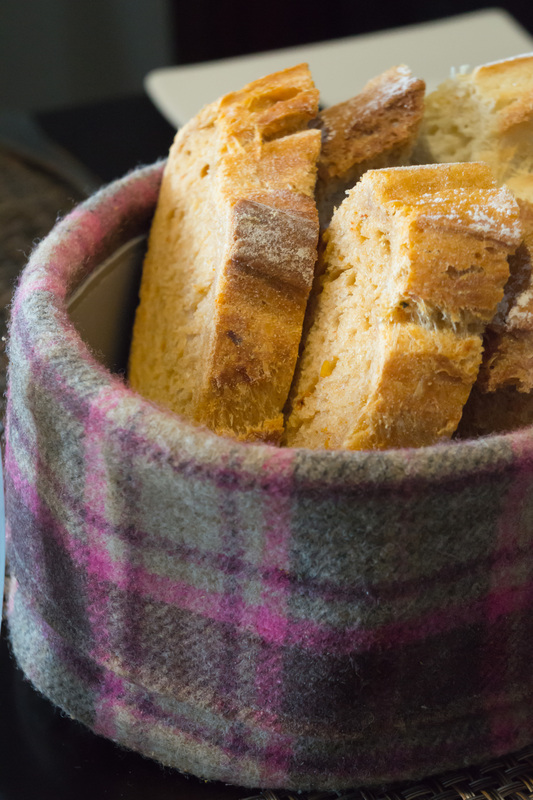 I’d say nice colour and tones, a little soft because of limited depth of field, but sharp where it can be expected to be. This one is also ISO 3200, but it’s been put through Photoshop CC Noise Reduction filter (NIK Dfine 2.0 looked superficially better but created artificial looking tone breaks) and then downsized to 3600 x 2400 pixels. There is no phase detect focus on this sensor, and the only focus method is contrast detection, as on earlier NEX models. It carries this out quickly and extremely accurately. Anyone used to the vague calibration of traditional DSLRs will be amazed by the lens quality the A3000 can reveal just through its pinpoint focus ability. No doubt this is helped by the rigid mounting of the sensor, which has no SteadyShot stabilisation and no vibration to clean off dust. The only self-cleaning is an anti static cover glass. 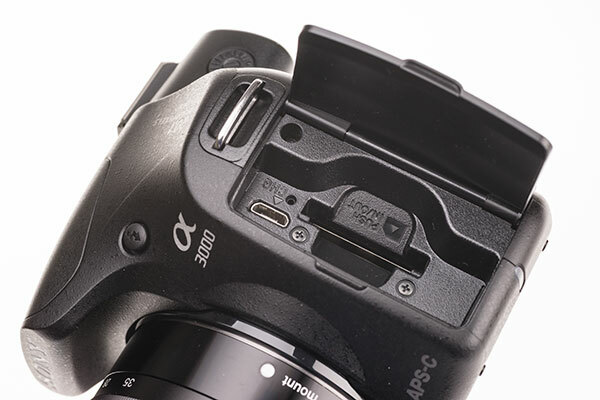 A rigidly mounted sensor requires none of the complex carriage supports and adjustments found in Alpha DSLRs and DSLTs right from the Konica Minolta Dynax 7D onwards. 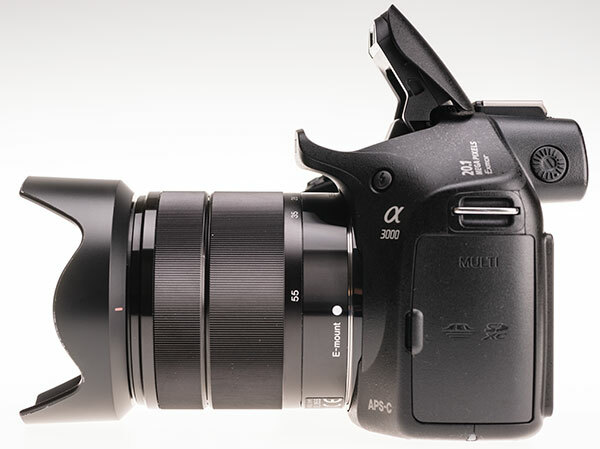 It is probably more accurately parallel to the lens mount than an Alpha 900 or 99, let alone any of the lesser models. Since the camera has an electronic first curtain focal plane shutter speeded 30 seconds to 1/4,000th and full PASM controls (with a little difficulty) with fully auto mode, scene modes and respectable plus-minus override and bracketing/HDR functions there is nothing an Alpha 99 or 77, NEX-7 or any other high end model can do to exceed its abilities except in some cases achieve a 1/8,000th top speed and shoot burst sequences faster and longer. Contrast and dynamic range from raw as exposed without any adjustment in raw processing. With adjustments for black, highlights, shadows, exposure the sensor shows that it has recorded plenty of detail in all zones. Used for single exposures, it’s just as much a professional tool as a Nikon D4 even though it might not last a week in the hands of a pressman. For £299 perhaps that pressman might consider buying a couple of these just to get into the next urban war zone street demonstration, or to cover a Spanish tomato fight. The pictures will probably be just as good and if the camera gets kicked into touch, the light plastic half empty body skin could well survive better than a crackable alloy jam-packed top model NEX. Without accurate focusing and exposure, the 20 megapixel sensor would be of little value. Since both focus and exposure are read directly from the sensor, they are about as accurate as you can get. The raw files also show a very good dynamic range and as expected it’s just a little better in ISO performance and DR than the Alpha 58, because there is no SLT mirror in the way. 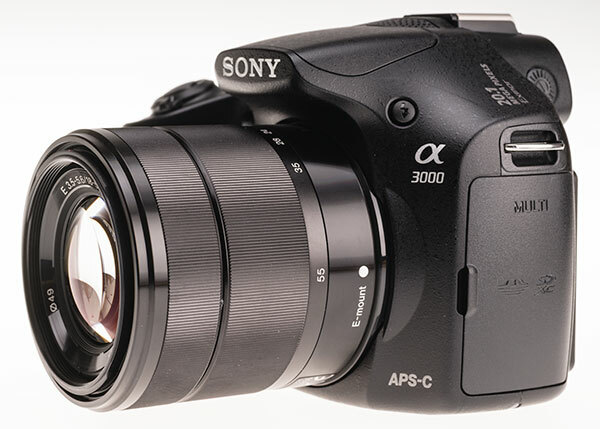 Again, despite being an entry-level camera probably designed for a huge Chinese and Indian potential market but sold worldwide to ensure it’s taken seriously, the A3000 has vital functions which Sony could have omitted in a purely consumer model. It has a setting for shutter release without lens, which makes it suitable for use with the vast range adaptors and third party lenses for the E-mount (almost every lens ever made for any format larger than half-frame, whether rangefinder or SLR). Will A3000 buyers want to spend as much again on Novoflex, Kipon or Metabones adaptors and legacy lenses? Maybe not, but they can, and they will work well on this body. It has a ‘Setting Effect Off’ option – that is for the LCD screen and the EVF, disabling the accurate simulation of exposure/contrast/colour, and permitting use with modelling lights and studio flash. It’s got AF Calibration, usable with the LA-EA2 phase detect Alpha lens adaptor, and the contrast-detect AF is compatible with many SSM and SAM focus motor lenses used on the LA-EA1. It has focus peaking for manual focus, with magnification, but the low resolution of both the EVF and the rear screen render this less functional than it is in some other models. A criticism has been made of a very faint click generated, apparently through the audio speaker, when the shutter is pressed. I thought this was a mechanical or electrical relay click connected to the operation of the E-mount aperture, but someone has determined that if the circuit to the speaker is cut (beep off does not work) the click disappears. Actually, the click indicates the moment of capture for brief exposures and the start of exposure for longer ones (like 1/15th). The first shutter curtain on this camera makes no noise, so you would press the shutter and hear nothing at all. Even ‘silent’ cameras like the RX1 and RX100 do make some noise from leaf shutters. This click is similar in volume or less. 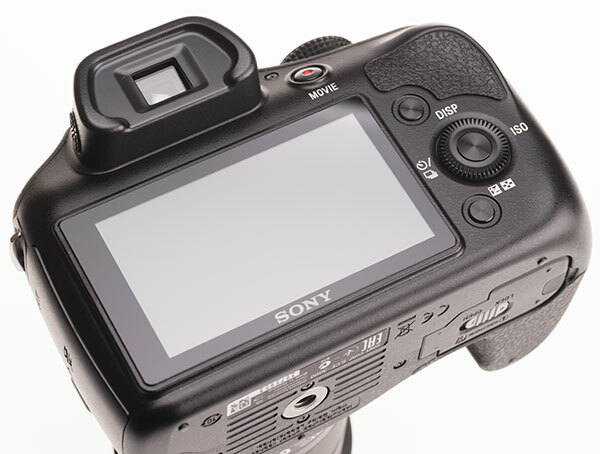 To me this indicates proper concern for the user in a camera where there may be no image displayed on the rear screen and the eye may be away from the viewfinder. You can tell when the exposure is made because the finder blacks out, but if you are not studying the finder, you would have no idea. 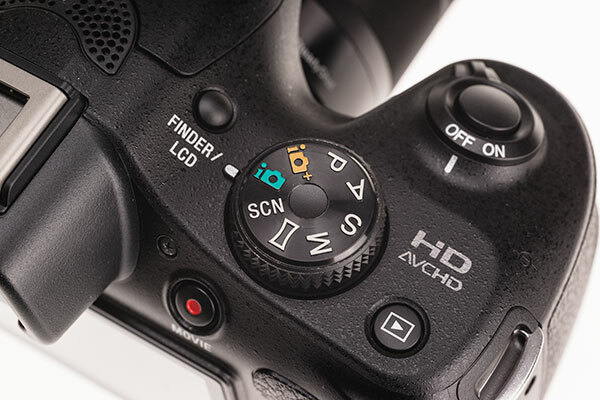 The shutter button does not have a very obvious point of resistance after first pressure for focusing and you do not have to jab it down. Very gentle pressure will take the shot. Electronic first curtain shutters are slightly confusing because all the mechanical shutter sound you hear happens AFTER the shot is taken. It is valuable to have this tiny audible clue, which no subject is likely to hear, that you have timed the shot as intended. The practical side of the A3000 includes a weight so minimal (281g body only) you can take it on a Thomson package deal flight and still carry your wallet and toothbrush as well. The bulk means you are unlikely to mistake it for your iPhone, and the shape means that some people will take your seriously as a photographer while others who would have ignored a NEX will shy away or physically assault you. However, if you hold it out and use the rear screen to compose, no-one will do either as they will assume you are a beginner and ignore you. To do this, you must press a button on the top. The camera has no eye sensors (it does not even have a rubber eyepiece surround and its 21mm eyepoint just helps to avoid the regularly clattering on spectacle lenses against hard plastic). This means that you can lift the camera to do a rear screen frame-up and the screen is, of course, dead. You get used to it. The mode dial appears to be metallic and has raised markings. Note the Finder/LCD manual switching button and the safe position of the Movie button away from accidental pressure (it can also be disabled completely). 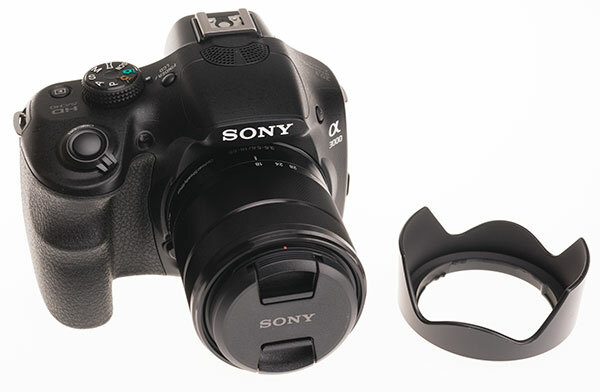 The camera lacks any kind of finger or thumb wheel so the adjustments are all made after the fashion of the most basic NEX (3 or 5 series models). This is only a bit of a nuisance when setting shutter speed and aperture manually. It does have a lockout for the movie button, a lesson learned from the notoriously free triggering of video shooting by the badly placed red button on countless previous Sony models. The button is actually placed where you wouldn’t hit it by mistake anyway – belt and braces. The 3 inch rear screen seems to have a very good quality finish – a better acrylic, or might it even be glass? Mine seems to be remaining unscratched to the same degree as Gorilla Glass protectors do. The EVF is only just acceptable in bright sunshine, when it is also most useful as the rear screen may become unusable. It does not really show the tones of the scene (take a shot and play it back and the difference is obvious) and it shows very little detail. You can make out all the larger shapes in a composition. In some ways it probably encourages good composition. You can’t really tell if the focus is sharp but green confirmation rectangles or a wide zone will activate, with beep if requested, and the shutter release won’t operate until focus is OK. It has optional grid line display and 25 focus points so the little display can get pretty busy. I have no interest in medium rate burst sequences personally as there’s hardly any action or subject where I do not prefer to time individual shots. A modest 2.5fps is no different to 3.5fps or even 5fps or 1.5fps for me. Really fast stuff like 8 or 10fps or Nikon’s incredible 60fps on the 1 V2 and AW1 has some appeal as this does give you a chance of optimum timing for sports and general action. The A3000 doesn’t. OK, photograph your toddler stumbling towards the camera, just don’t try to advertise the kid on Facebook. Try eBay instead, it’s a far surer way to get rid of them before they become too much trouble. The worst experience I’ve had with the A3000 has been EVF use in extremely dim indoor conditions, with or without flash, regardless of ISO set and lens used. The rear screen performs much better so it is not just a matter of the sensor’s live view feed. However, in typical well-lit interiors its only failing is that Auto White Balance doesn’t seem to work even if Setting Effect is enabled – it will look brighter than an optical finder, and reasonably clean and clear, but often show a strong colour cast which is not present in the final shot. 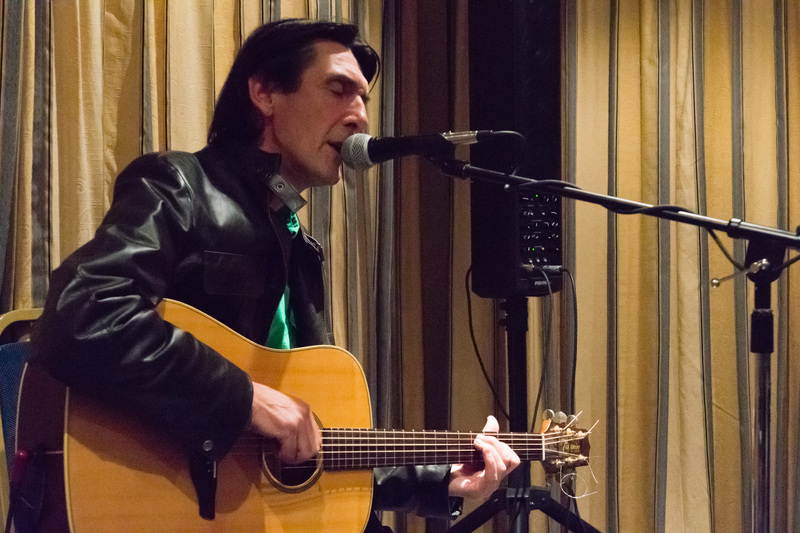 I’ve shot a few video clips with acoustic performers and found the sound to be good but very prone to auto gain ducking and boosting. To make decent videos with sound, you have to buy the shoe fitting accessory microphone or audio preamp unit. This is no great surprise as to date only the Alpha 99 has the right functions to control levels and use a conventional plug-in condensor mic directly. I started out by observing the miniscule size of the EVF display chip. I’m going to end with something unexpected. Snapsort.com’s camera comparer states that the A3000 has a larger than normal APS-C sensor, 25.1 x 16.7mm instead of the normal 23.5 x 15.6mm. If this was the case, the camera would gain a huge bonus point, as 1.6mm in 23.5mm would ‘turn’ your Sigma 8-16mm zoom into 7.5mm-15mm. But the handbook clearly states the A3000 actually has a smaller than normal sensor, 23.2 x 15.4mm. The Sony website says that it has a 23.5 x 15.6mm sensor. Amazon incorrectly lists the size of the original APS-C film format. 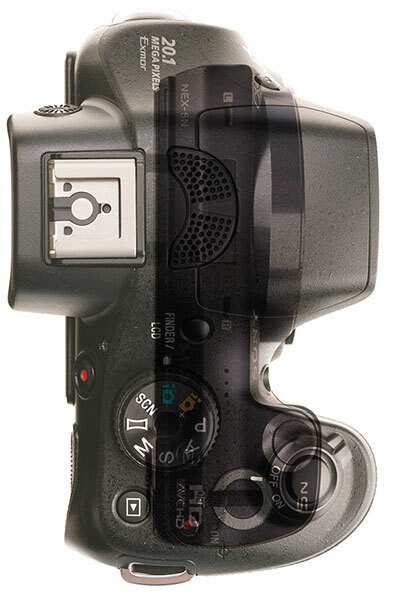 The handbook also claims that the EVF is 0.7X when Snapsort comparison specifications gives 0.49X – without knowing where this figure comes from, I can only confirm that the EVF is visually a fraction smaller than a typical 0.72X APS-C like the Alpha 580 (this is easily established by holding two cameras, one to the left and one to the right eye, and seeing how the finder windows compare). So don’t believe everything you read about the A3000. The 0.70X is true. The specs also show an extreme dioptre range (-4.0 to +3.5) for the eyepiece, which is necessary given the critical viewing conditions produced by such a high powered ocular and small display chip. 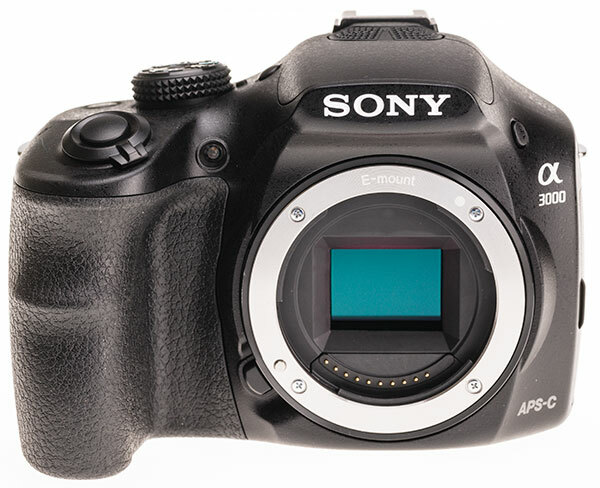 Actually the Snapsort comparator is very badly written, as it also claims a normal Sony Alpha body is 3.5 inches deep (it’s actually 2.55, 65mm mount to back, compared to the A3000’s 38mm) and that the A3000 is 4.7X smaller than an Alpha 57. This is based on measuring the A57 including prism and grip, and the A3000 on mount to back body thickness only. The A3000 is volumetrically 1.35X smaller including all external air space – the ‘box’ it can fit in – and in linear terms it’s only about 4mm less tall and 102mm long as opposed to 132mm. It’s small but there is a fair amount of bad measurement and worse measurement floating around the net. Don’t tell me stabilisation would not be a bonus even for the 16mm. If not, why did they make the 10-18m an OSS lens? The 16mm chrome lens looks rather odd on this body. Snapsort also lists the lack of in-body stabilisation as an advantage compared to the Alpha 57 because apparently in-lens stabilisation gives ‘less risk of blur’. In my experience the two methods are equally effective and our many Alpha bodies offer the choice between using IBIS and lens IS. The A3000 with IBIS (SS) would have been a great companion for the 16mm, new 20mm f/2.8, Zeiss 24mm f/1.8, SEL 30mm Macro, SEL 35mm f/1.8 and the Zeiss TOUIT 12mm f/2.8 and 32mm f/1.8 – not to mention the Sigma 19mm f/2.8, 30mm f/2.8 and 60mm f/2.8. All these excellent lenses currently must survive with no stabilisation other than pixel-shift electronic processing for video work on some cameras. The A3000 is very small, but the saving is mostly on width left to right, and on the thickness of the body disregarding the ‘prism’ overhang and the right hand grip. The grip extends nearly as far as any other Alpha, meaning that you actually get a much deeper inside surface so your fingers wrap right round. It gives the A3000 the most secure right hand grip of any E-mount camera I know, almost 30mm of sculptured rubber-skinned moulding. Like the rear of the body, this appears to be completely empty. It’s just a moulded grip with a few connections in the top for the shutter button and on-off switch. It does not even house the battery (NEX type) which sits well behind it. The cheapest kit for the camera includes a black 18-55mm f/3.5-5.6 SEL OSS. Well, I might as well admit I sold the black 18-55mm which came with my original NEX-7 for £200. Previous 18-55mms were chrome, I bought a Tamron VC DiIII 18-200mm, and the black lenses were in high demand. Now, I get one again, but in with an A300 body and the brand new price was only £349 – one month later, cut to £299. So does that mean I really only paid £99 for this body? 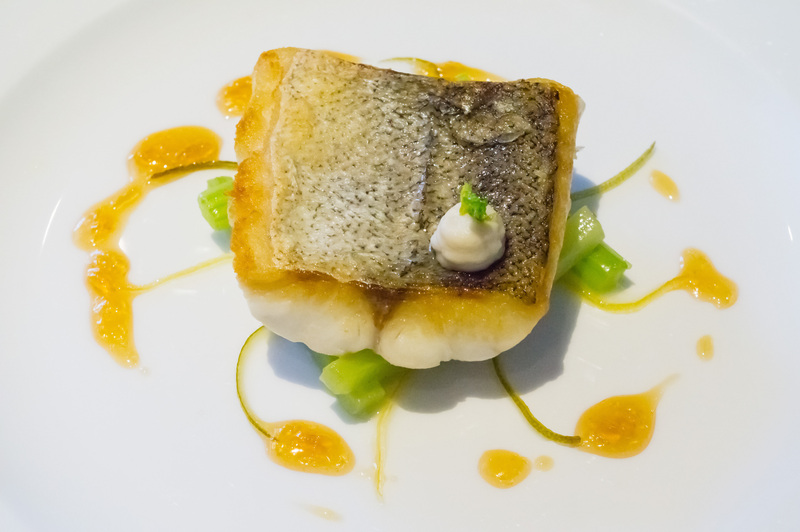 I was not over-impressed by the performance of the 18-55mm on NEX-7. Now I find this latest 18-55mm seems much better. It is made in Thailand, not Japan or China, just like the camera body. Sony must have opened a new plant or recovered the factory which was swamped by two metres of floodwater a couple of years ago. Whatever the case, the Thai contractors (whose story started with the Nikon Pronea APS SLR) have a highly skilled workforce now with almost two decades of experience. 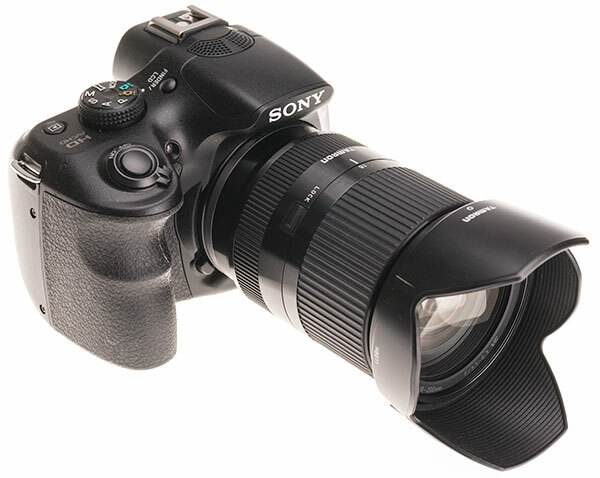 The A3000 looks great with the 18-200mm, whether Sony or Tamron branded. This lens is so good it compares with the Fujinon 16-50mm I was using recently, and Fuji’s lenses are generally a level above Sony in quality as well as cost. I have found the A3000 body to be a great companion for my 18-200mm as well. It just looks much better on this body, handles better with the right-hand grip, and focuses better than on my NEX-5n. The EVF with the VC stabilisation is better to use than any rear LCD screen when a lens can be extended to 200mm on this format. As you will gather, I have big problems with the very poor EVF of this camera. I don’t really have any issue with the relatively low resolution rear LCD. The only other thing which causes me any problems is that I’ve been using Olympus OM-D E-M5 for a while alongside my Sony kit, and I have come to value its in-body stabilisation. I felt able to buy a Sigma 60mm f/2.8 for the Olympus – this is a truly wonderful lens, equivalent to a 120mm on the MicroFourThirds format. I don’t feel able to buy one for the NEX as I know the combination of a 90mm equivalent lens and no stabilisation at all will result in poor sharpness from a super-sharp optic, in many of the conditions I like to use such a lens. Had Sony decided to put SteadyShot into this body, I think it would have made a great difference. The NEX mount market is just waiting for a stabilised-sensor body able to guarantee the best results from the hundreds of adapted lenses around (Olympus, of course, has a menu to let you enter the focal length of any adapted lens and thus ensure correct IS). But the price point would then have been missed and the precision of the assembly might have been compromised without even greater expense in manufacturing. I have been using the OM-D more often; its 12-50mm standard zoom is a very good lens, I have a 45mm f/1.8 portrait lens and now the Sigma 60mm which is semi-macro with a great working distance for flowers and fungi. The 5-axis stabilisation works well. I have a drawer full of legacy lenses, adaptors and accessories for NEX but all of them are let down by the lack in sensor stabilisation. 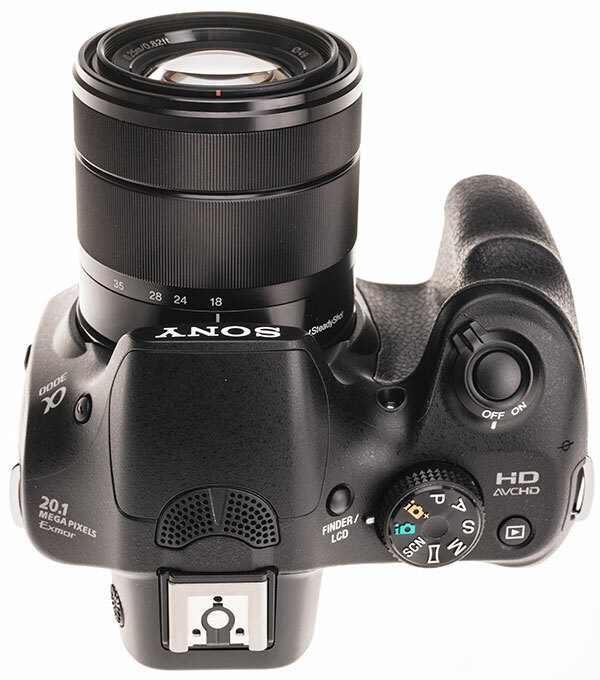 The only thing stopping me from ditching NEX and shifting to MicroFourThirds is the lack of a decent wide-angle within that system. I have access to 12mm (16mm+ converter) or 8mm (Sigma zoom with LA-EA1) but for the Olympus I really would need a 6mm lens and no such thing is made. So, do I sell the A3000? I like to buy rather than beg and borrow cameras for test purposes. Borrowed cameras are OK when it’s not possible – there’s a Canon EOS 70D kit about to land for a couple of weeks – but bought cameras don’t half focus the keyboard fingers. It is easy to be too kind to a camera lent to you for a couple of weeks. It is not so easy to be kind to one you have paid for, unless you are dishonest and think that writing it up favourably will make a camera you don’t like easier to sell on! Take the Nikon D600. We couldn’t lie about the showers of stuff deposited on the sensor by the shutter. We had bought a full kit. My reviews didn’t hestitate to mention the shutter issue. Nikon replaced the shutter in the camera under warranty and we immediately sold it, the buyer getting a considerable bargain (effectively, a 28-300mm Nikon lens, a GPS unit and a Sigma 17-35mm of proven performance thrown in free with a body that included a transferrable warranty). The buyer also knew who was selling it and could read the reviews. Now we see the Nikon D610 launched with an entirely new shutter mechanism, though Nikon has never once admitted the problem with the original D600. Reviewers and critics and technicians, 1, Nikon 0. Reviewer’s bank balance, -1. My inclination is to keep this camera despite no GPS and a poor EVF. 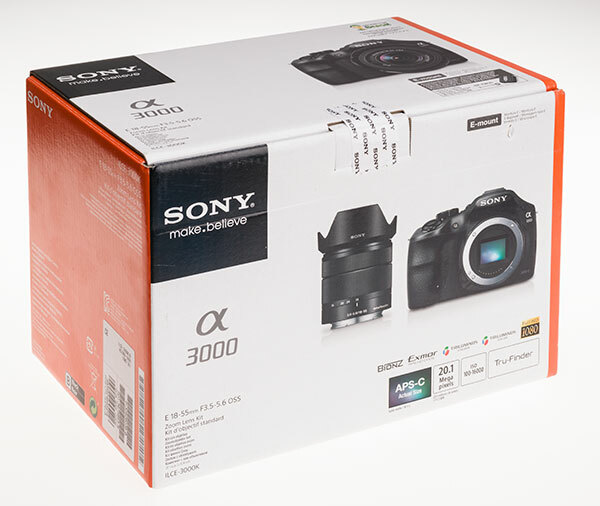 It’s so cheap that it is really only a swap for the NEX-3 kit I sold this year. I’ve written one paid review which writes off part of the cost of the camera (we make nothing from this website now unless visitors decide to subscribe to Cameracraft magazine which is not all that directly related). I can use it alongside my NEX-5n which is so much better with the 16mm f/2.8 – that lens just looks silly on the A3000. I can maybe even fit my optical finder to the 5n for the 16mm now. I have recently bought some extension tubes. The A3000 has all the contacts – but are they all wired? What a mess! Sony does not offer choice. It offers buyers’ dilemmas and buyers’ remorse, as in ‘did I buy the right model?’ or ‘did I pick the wrong system?’. 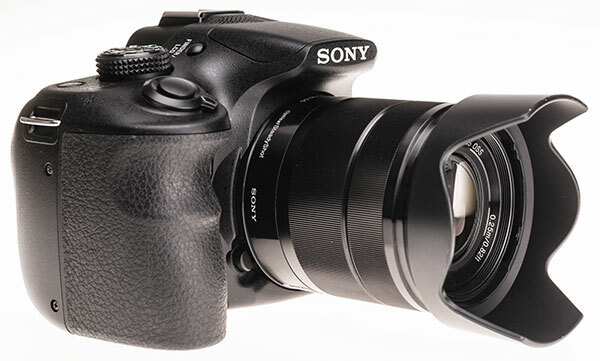 Sony is doing just the same with the Alpha A-mount system. You have to pick a sensor you trust over a viewfinder which is great or a format and lens kit change or controllable audio input or having GPS or missing your built-in flash. No way can you have it all in one body. Sony must surely follow this up with an A5000, or whatever, adding a few missing refinements to the camera and making it a £499 kit. That is what I would really like. But for the moment, the results from this cheap entry-level ILC are so good I have not touched the NEX-5n or the Alpha 77 since it arrived. And that is maybe the last word. Except for the full-frame NEX or the interchangeable lens RX1 or the NEX fitted with Olympus-derived 5-axis IBIS – or whatever mid-October brings. 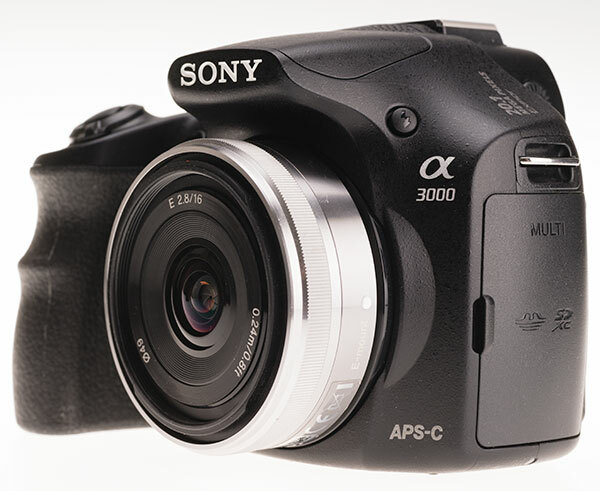 The A3000 is now sold for as little as £220 including in the UK (£185 before tax) and for $300 US. It is also sold with incentive deals for the 55-210mm E OSS lens, an excellent telephoto option, in addition to the 18-55mm. Am I upset that my camera’s value has been reduced? Well, I often sell cameras I buy to review, eventually. This one I decided to keep. It’s got the best imaging quality of ALL my APS-C cameras and so far, the 20 megapixel sensor responsible for this has not appeared in anything else except the plastic-bayonet A58. It’s a remarkable bargain now and it’s almost being given away. I’m struck by how Canon’s way of making the new EOS R full frame mirrorless system look rather DSLR-like resembles what Sony did in the A3000!